Tetlow King Planning (TKP) have been involved with a major planning appeal success for 100 homes at Launceston, Cornwall. On behalf of Hallam Land Management, James Stacey, Director at TKP, gave planning and affordable housing evidence supporting 40% affordable housing delivery at the four day public inquiry held in March 2014. James acted alongside other expert planning and highway witnesses from David Lock Associates, Barton Willmore and WSP. The advocate was Christopher Young of No 5 Chambers, Birmingham. The application was originally recommended for permission by officers at Cornwall Council. 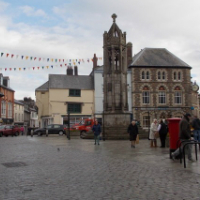 However the application was refused by Members for its impact on the local highway network in close proximity to a primary school and due to the Council considering that it had a sufficient supply of housing land to meet a five year requirement both across Cornwall and for the town of Launceston. The need to deliver additional affordable housing is all the greater due to a lower proportion of affordable housing being recently negotiated on another development in the town in order to deliver a new school. The appeal was allowed and full costs were awarded. The appeal was allowed and can be viewed here. © Image copyright Chris Downer and licensed for reuse under this Creative Commons Licence.